As many of you will now know, Amport Parish Council, along with the Amport Playground Refurbishment Committee, have worked hard to secure grant funding from Test Valley Borough Council in order to provide our community with a fully refurbished playground which is both sympathetic to its surroundings on Amport Green and provides our growing community with hugely improved equipment for the children to enjoy for years to come. This much needed and eagerly awaited project has been in the making for a number of years, and has required a great deal of time, energy and community consultation to actually make it happen. So it is with a sense of real satisfaction that we are now able to confirm that our new playground will be installed during the week commencing Monday 25th February. FAWNS, one of the UK’s leading playground providers will commence the playground refurbishment works on Monday 25th February, and all being well, the works will be completed on Friday 1st March. 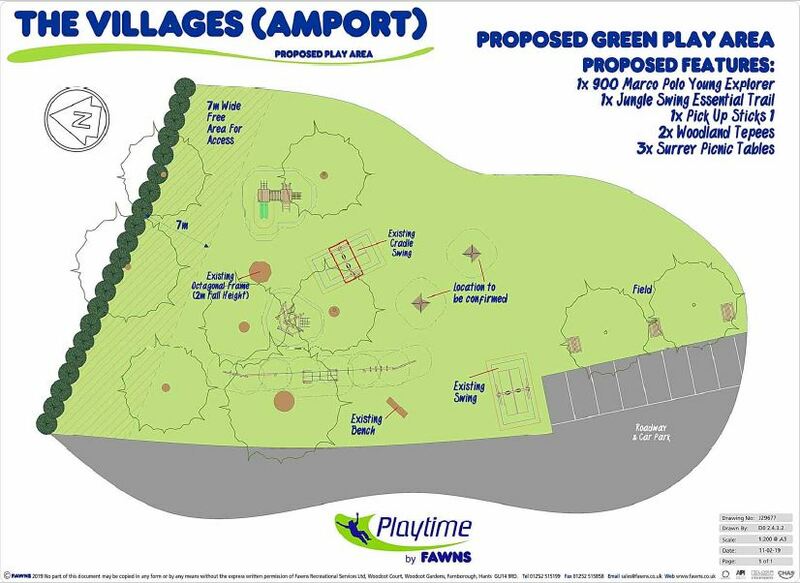 A Heras fence will surround the playground area for the duration of the installation, providing a safe working environment for the works, as well as the users of Amport Green. The new pieces of equipment will be brought in each day by the installation team which ensures no equipment will be left unattended overnight. To avoid as much disruption as possible, the FAWNS installation team will need the use the 3 car parking spaces closest to the swings, so please do not park in these spaces whilst the work is going on, to help avoid congestion, access issues and ultimately delay in installation. We thank you for your cooperation whilst these refurbishment works are undertaken. Gemma Pearce, Kate Cavalier, Ian Long, Jonny Kitson.